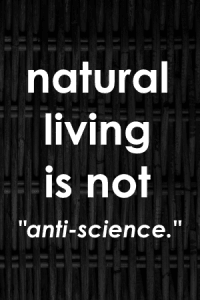 Natural living is not anti-science, but ok.
Natural/organic is all just a marketing ploy. 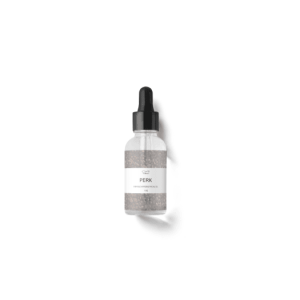 Anyone who discusses herbal medicine is “woo” and believes in magic. You have no right to speak into these issues if you don't have X degree, regardless of your education and independent study. Anyone who questions or moderates the use of GMOs or drugs is irrational and anti-science. The rise is pesticide usage is linked to developmental disorders in children, cancer, digestive issues, and other health problems. The current vaccine schedule has led to an increase in vaccine-related disorders and injuries. I mean, that sentence is annoying for me to even write because it's OBVIOUS. Have you seen this quote floating around? Probably. It irritates me to no end because it's absurd. “Science” has been “wrong” about a lot of things, because science is a process of collecting information and it takes time. That's fine. But blindly accepting whatever scientists are currently speculating is not thinking critically. Science isn't a “thing” for you to believe or disbelieve, it's a method of organizing information. Scientists once thought the world was flat. Scientists used to say smoking was great for your lungs. It's fine! Scientists are human and they make mistakes. Most of them are doing great work that's going to help humanity over the long haul. But think critically! Especially when it comes to your family's health. 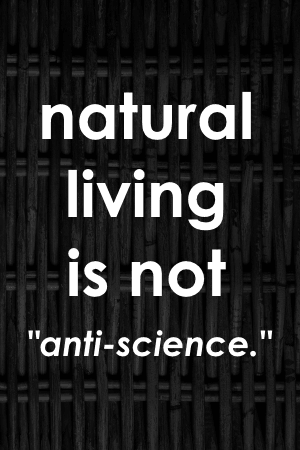 People who choose natural living aren't rejecting science. They're rejecting being experimented on. People who choose natural living are choosing to use methods that ARE proven over thousands of years as opposed to the methods that have only been around for decades. So which side is behaving irrationally? I love this post! I whole heartedly agree. And we should also say that isn’t ignoring correlations, and avoiding studying them in a controlled environment ALSO anti-science? Isn’t manipulating data to get results we prefer anti-science? Isn’t pretending that a logical explanation is wrong and the illogical one that is barely supported anti-science? And logical thinkers who buck the status quo are always persecuted by those in power, just like Galileo was. I see no difference with this. Thank you so much for writing. Amen, sister! Every so often I run across one of these groups and get sucked in to reading their egotistical mocking. I get annoyed, but then very sad at the thought of so many people so blindly trusting the powers that be with their health and ultimately their lives. I often wonder what they will think down the road when they inevitably get cancer or some other horrific disease and end up over medicated and completely debilitated. Will they regret their mocking and wish they would have listened and done their own research? Or will they continue to keep their heads in the sand and blame everyone else for their misfortune? All we can do is keep doing what we do, right? And hope it helps show one person the light. It’s hard because there are problems on both “sides” of every issue. So we all have to remain open to new evidence while at the same time not second-guess ourselves just because of bullying. It is so frustrating reading through some of those threads. Science is something that is needed, but something that is working to be proven. The defination of Science is: the intellectual and practical activity encompassing the systematic study of the structure and behavior of the physical and natural world through observation and experiment. When Science attacks us natural minded folks, it’s becausetheir method is failing or not producing and they are trying to prove something versus relying on tried and true methods.